I am looking for any information, particularly pictorial, on a type of musket rest/staff weapon called Swine Feathers or Swedish Feathers. Has anyone got any leads? Try the Landeszeughaus website (Graz) I know they had some, otherwise the Osprey series ''Gustav Adolf Infantry 30 years war'' has an illustration (p 19) - I'd scan it for you but mine's broken. Meantime I'll see what I can find on German websites. The mention of "Skelton's engravings" seems like a hot tip. I'm afraid that description from google books is rather misleading since the author has confused the swinesfeather with the early plug bayonet and have mixed source material regarding the two weapons. 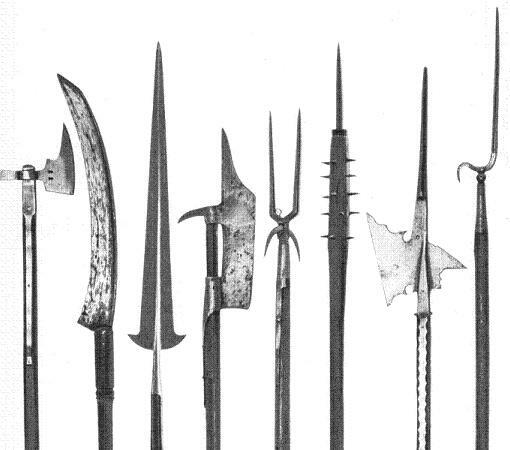 The Swinesfeather was basicly a shortend version of the pike which was issued to musketeers to provide additional protection from cavalry (it was used in the same manner as the Archer's stakes of the 100 Years War). The Swedes made extensive use for them when fighting the Poles & Lithuanians in the 1620's hence the "Swedish feather" name used by some authors. The Swedish army issued swinesfeathers in addition to musket rests which gave the musketeer a lot of items to handle at the same time. Hence Sir James Turner's description. Because of these problems there were a number of military writers who wanted to combine the musket rest and the swinesfeather. The problem was that it could only be used for one duty at the time, if used as a musket rest it was useless against cavalry but if planted firmly at the right angle to defeat a charge it was of no use as a rest for the musket. Ah...so it was meant to be a static defense rather than a Swedish Army Knife. Ouch. Talk about "heavily loaded." What's the provenance of that illustration, BTW? It's a bit interesting to see that the soldier seems to be wearing a helmet--and a burgonet at that--rather than a morion/cabasset or a hat, and it makes me wonder how early the depiction is. Is it from the Polish wars rather than the Thirty Years'War? Wendelin Schildknecht was a German Engineer who fought both against and with the Swedes in the 17th Century, in 1652 he published "Harmonia in Fortalitiis..." (full title below) which contains one of the best written descriptions of the swinefeathers used by the Swedes. 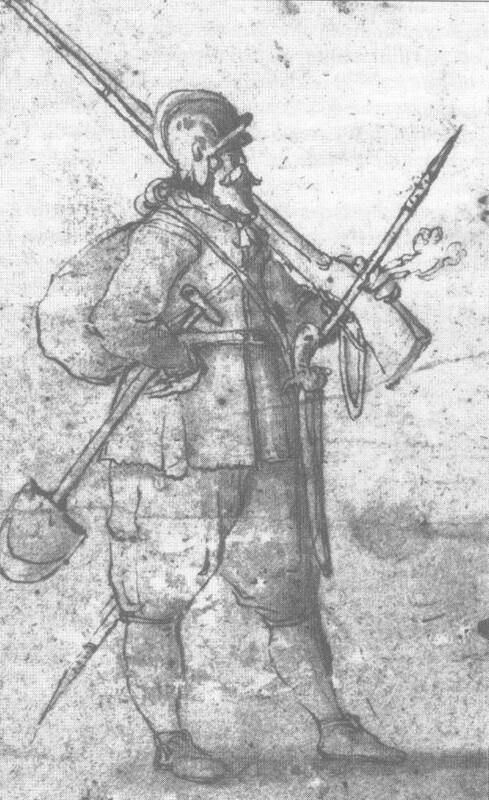 The Swinefather is described as "as strong, long and thick as the shaft of a "knebelspeiss" (mostly translated as boarspear in English) with a spike 2 "Spannen" (44cm) long at the front and a iron point at the rear. Little bit of necromancy, and surely too late to be of any help to Tod... but looking for something else, I´ve found this item auctioned on HH some time ago. It´s quite interesting and I actually think of re-creating something similar. Interesting. 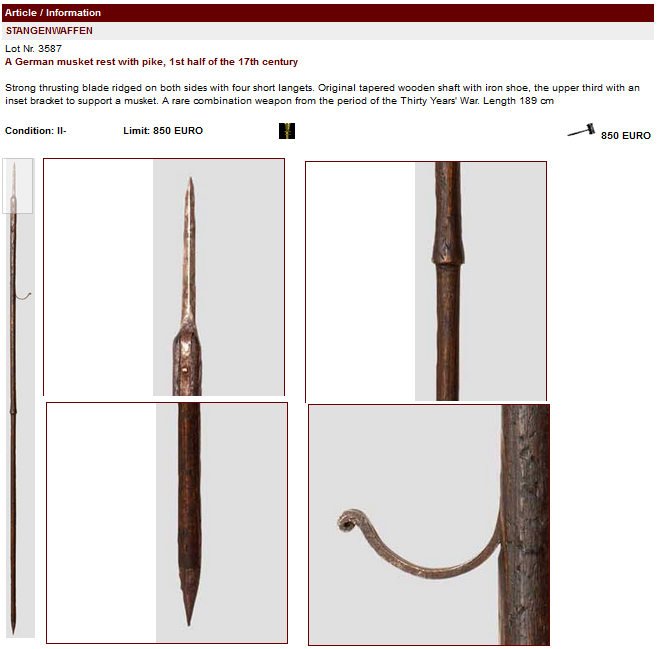 There is a weapon called a "saufeder" which literally translated would render "pig's feather" but it's not like the implements above, it is a boar spear. I also suspect that "feder" had an alternative meaning of "blade" kind of like how in English we can have the blade of a weapon or a blade of grass.